<!-~~~~~~~~~~~~~~~~~~~~~~~~~~~~~~~~~~~~~~~~~~~~~~~~ Aether-Physics.com by: Norm Silliman File created 10/08/11 Last Edited 10/08/11 ~~~~~~~~~~~~~~~~~~~~~~~~~~~~~~~~~~~~~~~~~~~~~~~~~-> Gryoc Thrust Revisited"
The first known visual documention of the effect that I am interested in was presented at Prof. Eric Laithwaite's 1974 demo of the 18lb gyroscope on a stand. [The Royal Institution’s 1974-75 Christmas Lecture.] If Laithwaite didn't discover this effect, he was the first to publish. He was the one to point the way. You will need the plug-in for Apple Quick Time to view these clips. Twenty years later came Jean-Louis Naudin's 1997 demo of a gyro moving up when pushed sideways, replicating Laithwaite's effect, with a compact desk-top device. Then ten years later, came William Alek's 2008 replication of Naudin's results, with another desk top device. 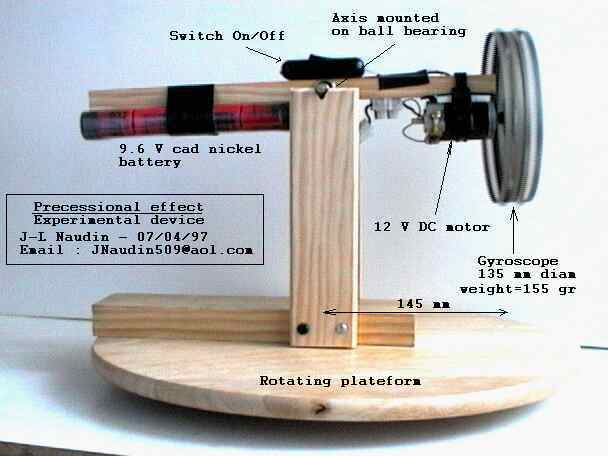 Two more years went by before I built a demo  with a twist, of gyroscopes moving in a wheel motion, showing the same reaction to a side-ways force. Since this arm is free move 360 degrees, the action of a right push, then a left push (repeated) cause the arm to rotate continously. What is The pattern of These Demos? It appears that when the force goes in the side of the gyroscope, the force comes out at a 90 degree angle. The effect of the counter-clock wise push results in an upward motion of the gyroscope. Two More Pieces of Evidence. In stead of pushing the side of the arm, what happens when you push the arm UP? The video shows the arm moving side-ways as a result of the arm being pushed up. That means the two actions are mirror images of each other. This appears to be the first know "force" translator, where a force vector into the gyroscope is transfered out of the gryoscope in a new vector at a right angle to the incoming vector. Prof. Eric Laithwaite mentioned (in the video at the top of the page) that his "gyroscope on a pole" did NOT generate any centrifugal force as it circled the pole. This demos shows approximately the same effect. And in the "reciprocal motion demo" above, the arm demonstrates the complete lack of inertia. When the arm is pushed up, the arm moves toward the viewer, BUT when the upward push stops, the forward motion comes to a complete stop. This is NEW information that gyroscopes change the old definitions of inertia and force. The puzzle continues, BUT we must always follow the evidence!